This was a day of fishing lessons... Our granddaughter Grayson who is 3 had been asking her Papa to go fishing. We were camping at Lake Cachuma, off Hwy 154, between Santa Barbara and Santa Ynez, California. Slade is our 2 year old grandson. Both with their tackle boxes in hand took the walk up the trail to the dock with their papa to have their first lesson in fishing. Both poles were Ugly Sticks (only the best according to Papa) and rigged, but had no hooks. Since this was their first time Papa wanted them to practice safely. LOL. Both of them were very focused. Grayson was very determined and learned how to reel in and cast that day. Slade learned how to reel in and to fill his belly with Gummy Worms. Obviously no fish were caught that day but the lessons learned will be with them the rest of lives. Our greatest blessings these days come from our grandchildren. Congratulations on taking Second Place in the 2011 Fishing Photo and Story Contest. What a wonderful picture and story! Thank you for participating. I love the fact that you are taking the kiddos out fishing. Those times are great learning experiences for children and help build excellent character. Along with the photos, every one of you will be able to cherish those memories for a lifetime. What a great day of fishing lessons,... and I'm sure there will be many more to come. This reminds me of an old time picture. Nothing better than memories of a simpler time. Especially when you can capture them like this. Saved for at least one lifetime. Beautiful..
Life is good when you have little ones... grandma's are so blessed!! WHAT A NORMAN ROCKWELL THIS IS! NOW I CAN SEE... THE FISH STORIES START EARLY IN LIFE. THIS LITTLE 2 YEAR OLD SAID HE CAUGHT A BIG FISH WHEN IN FACT HE CAUGHT NOTHING! OUT OF THE MOUTH OF BABES....GOTTA LOVE IT! THIS PHOTO HAS MY VOTE! THESE KIDS ARE SO CUTE, THEY SHOULD CERTAINLY TAKE THE PRIZE! HOW CAN IT GET ANY BETTER THAN THIS???? THE FACT THAT THEY WERE ABLE TO STAND THERE AND EVEN LISTEN TO DIRECTIONS IS AMAZING IN ITSELF!! MY KIDS WOULD HAVE BEEN IN THE WATER IN ABOUT 5 MINUTES!! Adorable little ones..and this sure is a WINNER in my book. This is what life is all about. I love it! This could have been a Rockwell painting... if a picture can paint a thousand words this one is infinite.. while showing a specific story, there's something about it that begs you to latch your own experiences onto it as it becomes a part of you... beautifully done! Some of my best childhood memories are centered around fishing. Great picture and thanks for the flashback. This is how it begins! No need to worry if you don't catch a fish today. There's always tomorrow. They are so sweet in their innocence. Lucky grandparents to have moments like this with your grandchildren. And they thought they were fishin!! Of course Papa new better, when you love so deeply memories are inevitable. Love this award winning picture! Someday they will look at this picture and be so happy you captured the moments. Good luck on the contest. This picture reminds me of a great painting I would buy. Innocence and such determination. That's a lot of concentration for such little ones. lol What a great capture of that moment in time. I absolutely LOVE this picture. I think that it could have taken 1st place in the contest. Oh well, second place isn't too shabby either. I was rooting for you and this picture and story in the contest. Great story. And adorable grandchildren there. Keep up the good work. 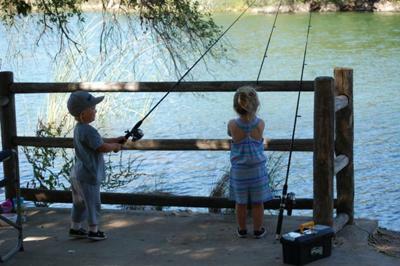 It sounds like they have a lot of fun fishing with you and papa.